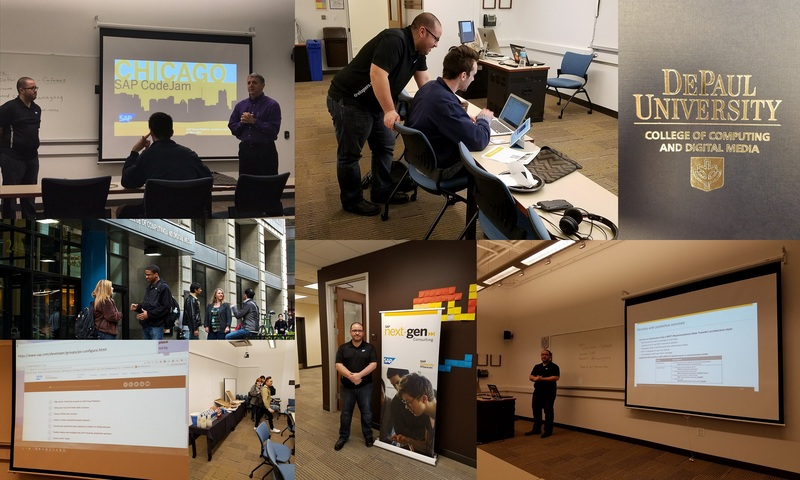 On Monday May 8th, we held a SAP CodeJam for SAP Cloud Predictive Services at DePaul University in Chicago. Students from several universities in Chicago attended along with local IT professionals and SAP employees. This was SAP’s first CodeJam at DePaul and they provided a great facility for the event. This served as an introduction to developing apps and using predictive services on the SAP Cloud. All our participants were new to using SAP in this fashion and worked through a series of exercises over the course of several hours. Led by SAP’s Abdel DaDouche, the CodeJam provided access to useful exercises and tools for building applications on the SAP Cloud. DePaul University is nation’s largest Catholic university — committed to an educational experience that weaves together mind, place, people and heart. Founded by the Vincentians in 1898, the university takes its name from the 17th-century French priest Saint Vincent de Paul. Following in the footsteps of its founders, DePaul places special emphasis on recruiting first-generation students and others from disadvantaged backgrounds. The university enrolls around 16,000 undergraduate and about 7,600 graduate/law students, making DePaul the 13th largest private university by enrollment in the United States, and the largest private university in Illinois. The student body represents a wide array of religious, ethnic, and geographic backgrounds, including over 60 foreign countries. Students in the School of Computing have access to the latest technology and specialized labs in research areas such as artificial intelligence, visual computing and multimedia networking and the opportunity to be part of exciting research projects in and out of the classroom. Courses are taught by full-time faculty who conduct innovative technology research as well as industry professionals who are active in shaping today’s IT industry. I want to thank my SAP colleague Abdel DaDouche for his leadership and support of this event which will serve as an important milestone in expanding the SAP Next-Gen Innovation Network in Chicago. Thanks as well to our partners at DePaul University for their hospitality.